I’ve come to realize that the status quo for the weekly photo challenge always inspires creative thought. Lately I’ve been more busy than writing could possibly tolerate, and currently get granted only small bits and pieces of my days to play with words instead of the wide-open schedule that travel used to bequeath. The principles of nostalgia compliment the quintessential being of forward, in my humble opinion, and this portrait embodies that relationship. My semi-permanent hiatus from travel (aka: re-entry to the United States) was taking place, and I was in limbo between beds, couches, and futons of friends and family. I took this image amidst the shuffle between Upstate New York, Boston, and Newport that has been my reality for the past three months. 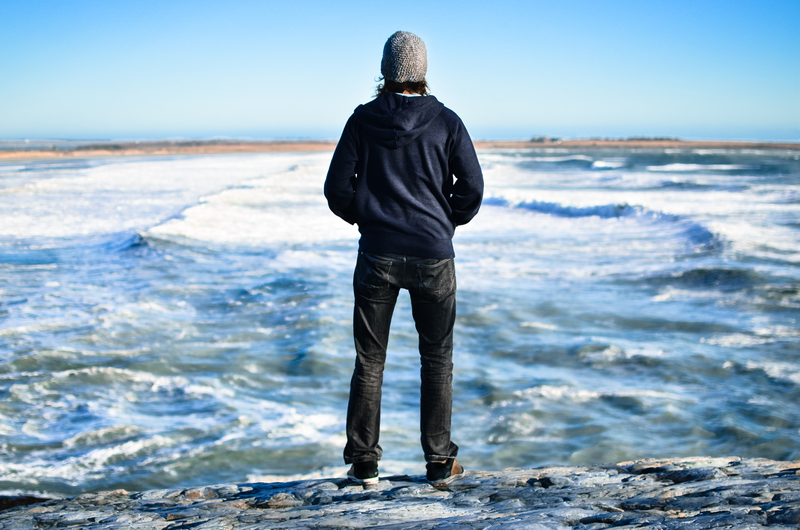 This self portrait was shot in Newport, Rhode Island earlier this month at high tide on a choppy winter’s day. I chose to take this in the same exact location of a prior self portrait, which also was the former top banner for this blog. That silhouette was shot almost 2 years ago, when the idea of traveling around the world was just a seed planted in my mind. I had rediscovered the thrill of anticipation that wanderlust procured. I had no idea what I was in for. The experiences took me to places I could have never possibly predicted. My feet walked through rainforests, up volcanoes, down dusty cobblestone streets, to high alpine lakes, and through Caribbean desert beach sand. My legs carried me through an endless series of hikes into unknown territories, countless cavernous Latin American mercados, long lived moments of searching for a decent bed to sleep on, and around every corner on every street. I made friends with souls I could have never possibly met form the confines of my comfort zone at home, which can kind of feel like an un-comfort zone when you get back from a long, meaningful trip. My mind soaked in every moment of travel with an almost addictive attention to details. Hence, my habit of writing way too much continues to press on. My curious mind wanted to obtain the full picture of every place we came across, and it seems to have got what it wanted. Wanderlust took me to places I would have never known without it’s friendship. In this new portrait, I’m facing the world in an old familiar place. I’m a different person now. I’m older, gazing forward, enjoying the virtues of the view ahead while at the same time reflecting on the past. This is a common practice in my mind. It is also a gift that I learned I can give myself to help relive the experience while I write about places I used to know in person. Forward is indeed uncertain, but it is one of the best ways we can grow. Love the roiling water rocky coast. Keep writing. You’ve a talent. Old gal response to this entry: “Onward, through the fog.” Indeed. Thank you for those warm remarks! I really love the photo of the man and the ocean and also you have a way with words. I enjoy reading your post. The man near the ocean is me! Thanks for the comments and for stopping by. Rebecca!!! I just got YELLED at by Elissa for not giving her your email address! I am in the doghouse BIGTIME!! We landed back on the East Coast when we realized that coming home without a dime in our pockets was not as cool as it sounded when we were south of the Equator! We had some connections for some work to get involved in Boston so we ended up here. Are you two down south yet?? I hear New Orleans calling our names! Excellent shots! Perfect for the theme.